Agra-based business-to-business (B2B) marketplace for leather products ShoeKonnect has raised an undisclosed amount in an angel round of funding from Indian Angels Network (IAN), a top company executive told Techcircle.in. The firm plans to use the capital for technology enhancement, marketing, brand building and team expansion, ShoeKonnect co-founder Siddharth Vij said. Bizcrum Infotech Pvt. Ltd, which runs ShoeKonnect, was founded in 2014 by three economics graduates from Delhi University—Siddharth Vij, Chaitanya Rathi and Siddharth Rastogi. While Rathi earlier co-founded Beghar.in, Rastogi previously worked as a tax analyst at PwC (formerly PricewaterhouseCoopers). Vij's family runs footwear and apparel manufacturing businesses. Bizcrum aims to make industry specific B2B mobile platforms. ShoeKonnect is its first product for the footwear market. It brings manufacturers, retailers, component suppliers and buyers to a single platform, using a mobile app. It follows two business models. It acts as a pseudo marketplace for retailers and manufacturers and enables retailers to procure directly from manufacturers. The startup earns a commission on each transaction and takes care of payment and logistics. It also has an open marketplace, which is a free platform where footwear sellers can post products. It also offers chat and call facilities to help users connect with businesses. 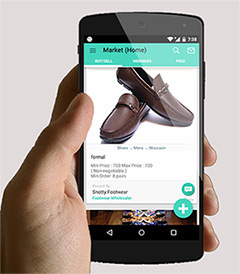 ShoeKonnect connects more than 5,000 footwear businesses on its mobile app and gets requests from Thailand, Pakistan and Bangladesh, among other countries. It claims to get more than 100 product postings daily. It also claims that weekly gross merchandise volume (GMV) is more than Rs 2 Lakh. "Footwear is not a tech savvy market. Retailers have the habit of paying and buying traditionally. We are trying to change that," said Vij. Currently available on Android Play Store, the firm will soon be launching an iOS version as well. India is the second-largest footwear producer globally after China. India's total retail market is worth Rs 33,592 crore and is expected to cross Rs 54,000 crore by 2017. The company claims that it is supported by various organisations, including Indian Footwear Components Manufacturers Association, Council for Leather Exports and Agra Footwear Manufacturers and Exporters Chamber. Pragya Singh, associate vice president, retail and consumer products at management consulting firm Technopak, said the B2B market is untapped and there is enough space for online players to come and organise the sector and bring efficiency. "Whatever is happening in the B2B market is still small. Also, B2B is a low-margin, high-volume game and there is high dependency on credit. At the same time, online gives sellers a wider market to reach out while buyers get a bigger sourcing network. Their success will, however, depend on what more value they are adding so that credibility is established," she said.